Located where Highway 6 and Highway 302 are merged. This location has a traffic count of about 17,700 vehicles per day. There is approximately 24.39 acres and approximately 240 feet of road frontage. 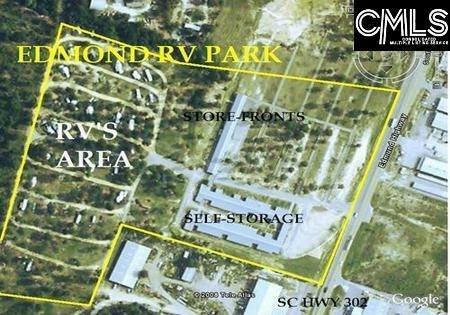 The property has an RV park with 100 spaces and the business is very healthy. There is is private water system with well, septic, showers, and laundromat. Public water is currently available on Edmund Highway and it is expected that public sewer will be available sometime in 2018. There is a building with 13 storefront units and approximately 10,000 square feet. One of the units is occupied by a Lexington County Sheriff sub-station. There are two pole buildings with approximately 20,000 square feet under roof that is being used to house a mini-warehouse business. This business is also healthy. There are 62 storage units and room for expansion. There is an apartment to house an on-site manager. All property can be combined or subdivided. It is zoned for Intensive Development. Water Main Diameter: 12 inch, Natural Gas Provider: SCE&G, Electricity Provider: Mid-Carolina Electric Cooperative, Telecom. Available: Southern Bell, Fiber Optics Available: Cable Available: Time Warner, Fire Department: Edmund Fire Department, Distance to Fire Station is .3 miles,Fire Dept. 's ISO Rating: 7 ; Property includes Parcels 008800-03-046, 008800-03-045, 008800-03-043 and a detention pond on 008800-02-010.